The first 3 goodies: Little gift cards, a puzzle and a little mirror. 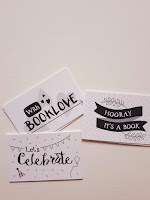 I love the gift cards, because as a proud bookjunkie I give books away a lot as well. It's always so much fun to wrap the book and put a nice bookcard on top of the gift. I also like the small mirror, because of the colourful decorations. 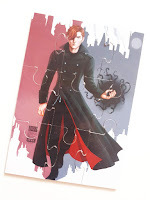 The puzzle, sadly, was something I already found in another bookbox. 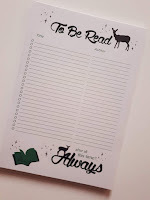 But hey, I can give it away to another booklover! 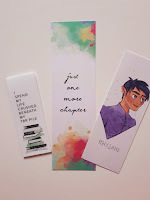 BOOKMARKS! Yay. I love the middle one the most, it says Just one more chapter. I didn't have the other two yet, so I can add 3 new bookmarks to my collection. The left bookmark is magnetic and it says I spend my life crushed beneath my TBR pile. And the right, OF COURSE, is Rhysand *sigh*. 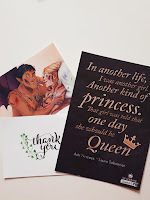 3 nice cards, one with Rhysand and Feyre and one from Ash Princess; that one is signed, even though you don't see it that well on the picture. This goodie is my favorite. 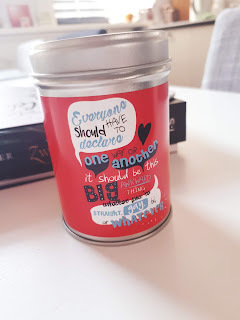 It's a small jar and I was just looking for a small jar to keep some of my fresh tea, so I'm very happy with it. I love the quote on it, I think its from Simon vs. The Homo Sapiens Agenda. I'm so excited for the book! I have seen SO MANY good Reviews for it and I can't wait to dive in. 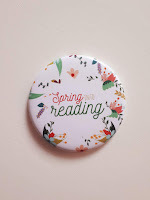 It was already on my TBR. 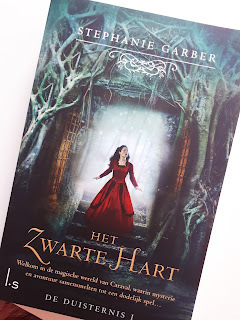 Maybe you don't recognize it because of the Dutch cover, but this book is Caraval by Stephanie Garber! 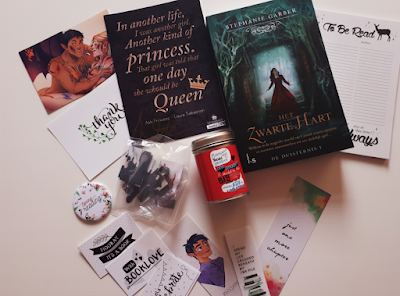 I'd love to talk books, so please: Let me know what goodie you like most, and if you have read Caraval!